With prices of roofing materials skyrocketing every day, real estate and industrial developers are looking for cheaper roofing materials to save on the cost of construction in Kenya. One such material is light gauge steel truss, which is quickly replacing conventional timber. Trusses are used in a broad range of buildings, mainly where there is a requirement for very long spans such as in airport terminals, aircraft hangers, sports stadium roofs, auditoriums, residential houses, churches, schools and other leisure buildings. Demand for the product for residential and other buildings has also been growing. 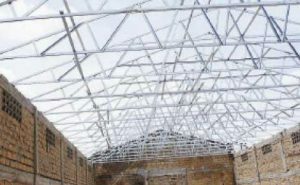 Many of the reasons steel trusses are gaining popularity in Kenya, also can apply to the North American market. These include the increase in timber prices and increased awareness of the advantages of light steel trusses experienced by many of the construction industry’s leading contractors. A steel truss is made from steel coils coated with a protective alloy of aluminium that forms a protective barrier against corrosion. It also uses zinc for safeguarding the edges and scratches and silicon as a binding agent. During installation or roofing, material is cut to size then delivered to site in neat packs. Truss members are screw-fastened using self-tapping screws and a screw gun.